« Will anyone beat Candiotti’s Cleveland mark for 200-inning seasons? On June 8, Seattle ace right-hander Felix Hernandez had a dominant outing at Tropicana Field, tossing seven shutout innings with a career-high 15 strikeouts in the Mariners’ 5-0 victory over the Tampa Bay Rays. Unfortunately, Hernandez got a no-decision as the Mariners couldn’t score until the ninth inning, when they plated all five of their runs off Grant Balfour. Hernandez, who lowered his ERA from 2.57 to 2.39, gave up only four hits with a walk as his record remained at 8-1. Of course, getting no run support is nothing new for Hernandez, who from 2010-2013 logged an ERA of 2.95 over 131 starts only to go just 52-45 — just seven games over .500. This season has been a nice change for him, as prior to the start against the Rays, he had received 5.66 runs of support from the Mariners offense. Still, a special outing for Hernandez with the seven shutout innings and a career high in strikeouts. 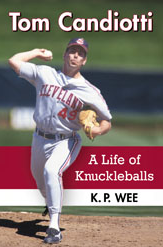 That reminds me of a start by Tom Candiotti on August 8, 1991, when the knuckleballing right-hander pitched seven shutout innings of four-hit ball with 12 strikeouts and only three walks against the Detroit Tigers. Candiotti, however, also got a no-decision because his Toronto Blue Jays were shut out in a 4-0, 14-innings loss. Candiotti’s 12 strikeouts tied a career high and also equaled the Blue Jays’ franchise record for a single game. It was Candiotti’s eighth start with the Blue Jays following a mid-season trade, and the fourth time with Toronto he had begun a game with seven shutout innings. The Blue Jays’ single-game mark of 12 strikeouts would be surpassed in 1994 by Pat Hentgen, and then Roger Clemens eventually set the current club record of 18 four years after that. What’s interesting is that, for years and even to this day, the Blue Jays record books have kept showing that Candiotti walked nine batters in that August 8, 1991 start to equal a club record even though he issued only three bases on balls that night! I’ve also seen this error in print by going through the Blue Jays media guide. This despite the fact that I had written to the Blue Jays back in 2010 to notify them of the error. 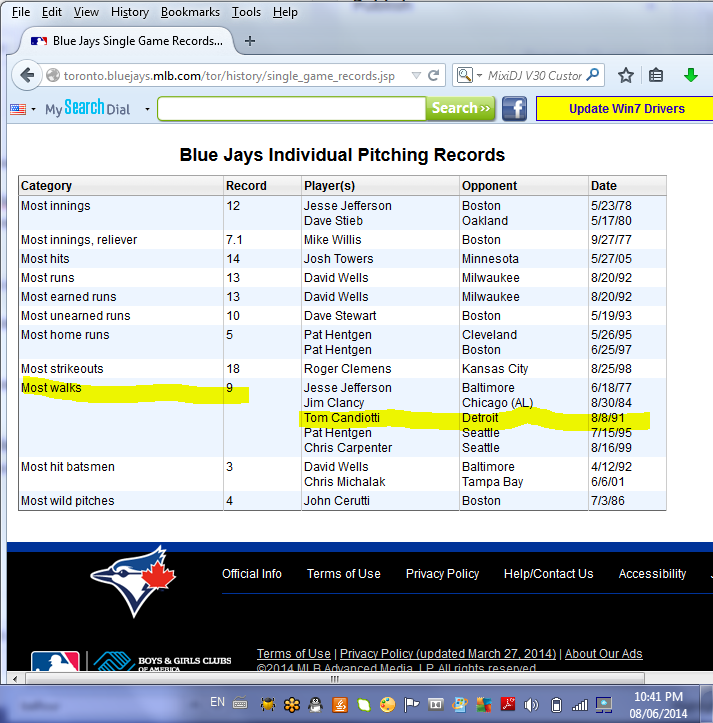 Well, at least Candiotti remains in the Toronto record books for something, right? Anyway, congratulations to Felix Hernandez for the shutout ball and the personal strikeout record. Congrats too to Candiotti for continuing to be in the books for a record he wasn’t even a part of. This entry was posted on June 9, 2014, 5:10 am and is filed under Blue Jays Baseball, Blue Jays Records, Shutouts & Scoreless Streaks, Strikeouts...strikeouts...strikeouts. You can follow any responses to this entry through RSS 2.0. You can leave a response, or trackback from your own site.